I have always loved the colours that you get with natural dyes, their soft watercolour shades are so very British. 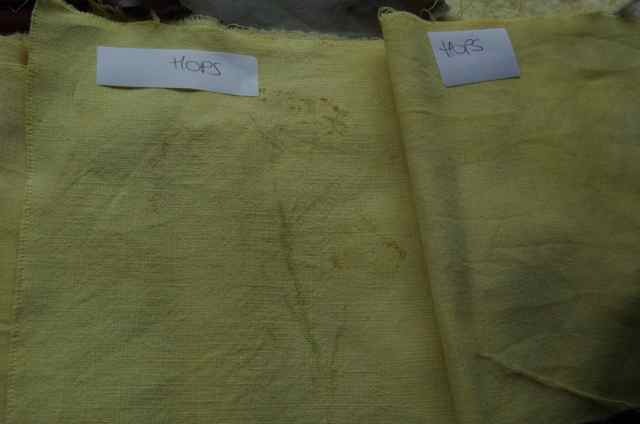 I have been wanting to ‘have a go’ for some while and obviously wanting to experiment dyeing with hops. 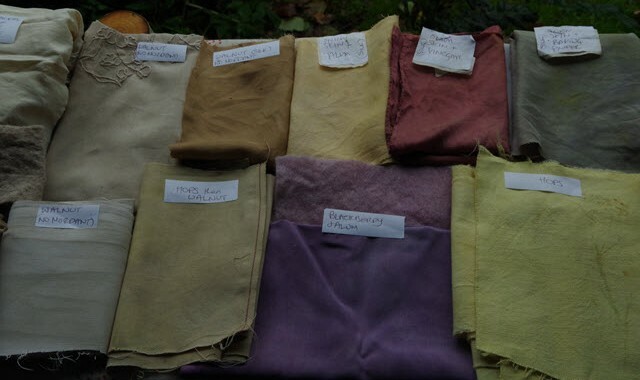 When I was searching the internet for information about natural dyeing before hop picking I came across this lovely site . (Donna and Bill of the hops soda success) and was even more determined to have a go asap. Along with different weights of linen and cotton fabrics, I also used some pieces of silk cut from an old shirt. Gathering up this mixed bags of scraps, I used the few blackberries I had reserved in the freezer, dried hops and some local walnut husks. All set, gloves on and the experiment is ready to begin. My last efforts had resulted in insipid, wishy washy colours, that literally came out in the first wash, but this time I was using different mordants and used an old aluminium saucepan for the boil. Apparently this is better than stainless steel for some reason which I do not know, but handy anyway as I had this redundant old aluminium saucepan with a good solid base. The mordants I tried this time were vinegar, baking powder and alum. First I simmered 3 pieces of silk with red onion skins, then divided it up and put each in a separate batch with a different mordant, vinegar, baking powder and alum, after each boil I put the mix into a separate polythene bag and left them all for 2 days. Next I dissolved alum into some water, added 2 handfuls of dried hops boiled them for an hour with the fabrics all mixed in together, then left the whole caboodle for 24 hours to soak outside covered with a lid. I have yet to try vinegar as a mordant with hops and possible baking powder. Not knowing what end results will be is the best bit but not the waiting. Waiting is trickiest, it is hard to be patient but once the soaking time was over, I rinsed them all, then gave them a gentle wash with detergent and hung them out to dry. 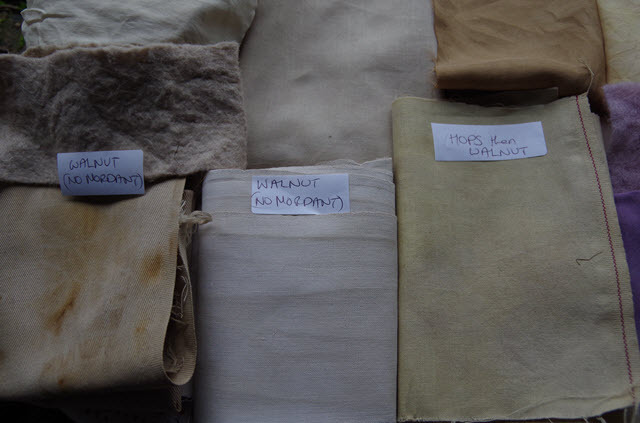 Walnut husks produce a brown dye which does not require a mordant to fix the colour into the cloth. That makes it easy, the whole lot was boiled and left it to soak overnight. It is a shame that dyeing with hops makes a yellow dye as I am not keen on using yellow but a little can enhance other colours in a project. Next spring I will try hop shoots and leaves, they are supposed to produce a brownish red dye. 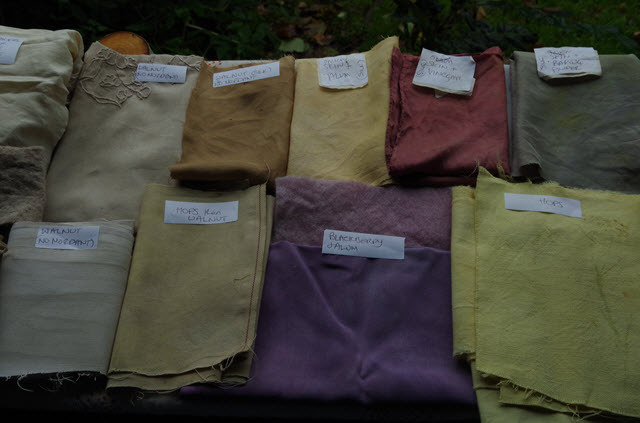 The dyeing results from this first session are all shown. I was fascinated to see the differences in colour between the red onion skin dye lots using the 3 different mordants, that was a hey presto moment when they were ironed to fully reveal the colours. So what are they for? Well they are all intended for a special project that I am doing with my daughter in Australia. Since she emigrated to Australia with her husband 15 years ago, we have made 4 friendship quilts. Over the months we send and swap little pieces of fabrics in letters, but this time we have decided on a smaller project in the form of a scrap book.